SpaceX scrubbed the launch of its Falcon 9 rocket at the 11th hour due to high winds, the company announced. The rocket was set to carry the EchoStar 23 satellite into high orbit. The launch was scheduled for 1:35am local time from Cape Canaveral, Florida, but was called off ahead of the 2.5-hour launch window due to high winds. Patrick Air Force Base had given only a 40 percent chance of favorable conditions for the launch because of thick clouds and high winds in the area, the Verge reported. Standing down due to high winds; working toward next available launch opportunity. The weather that prevented the mission from taking off was the tail end of a blizzard battering the East Coast of the US, from the Mid-Atlantic up into New England. The area experienced widespread showers and thunderstorms before the cold front ‒ part of the larger system known as Winter Storm Stella ‒ moved into Central Florida by Tuesday morning, said Tim Sedlock, a National Weather Service meteorologist. The launch was originally scheduled for 2016, but has been pushed back several times, including in January and February of this year. 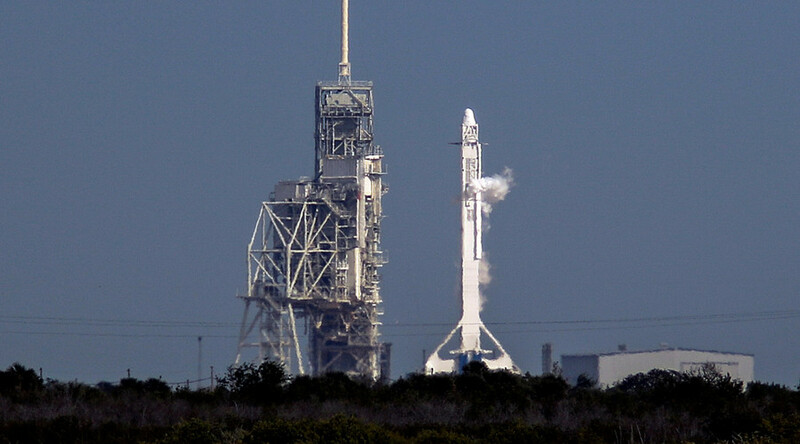 On March 9, SpaceX test fired a Falcon 9 ahead of the satellite launch. The EchoStar 23 is a commercial communications satellite that weighs about 6 tons, which is heavier than most satellites. It will launch to a geostationary transfer orbit ‒ about 22,000 miles (34,500km) above Earth ‒ where it will provide broadcast services for Brazil. The backup window for this launch opens Thursday at 05:35 GMT. The weather for that window is “90% favorable,” SpaceX tweeted. When the launch does happen, it will be the second from the historic Launch Complex 39A at NASA’s Kennedy Space Center, the pad used for the Apollo 11 and final Space Shuttle missions. In late February, the Falcon 9 took off on a resupply mission for the International Space Station loaded with 5,500 lbs (2,494 kg) of cargo, including a deadly superbug, as part of an experiment to examine how the bacterium will mutate in low gravity environments, with a view to improving antibiotic efficacy on Earth. Unlike the February launch, however ‒ which saw the first-stage reusable Falcon 9 successfully land back on Earth ‒ this mission will not include a rocket landing post-takeoff, SpaceX CEO Elon Musk said. The heaviness of the satellite combined with its high orbit require too much fuel to have enough reserved for a landing. In the future, such missions would use the Falcon Heavy ‒ a heavy-lift vehicle in development that is basically three Falcon 9 rockets strapped together ‒ or the Block 5, which is the “final upgrade of the Falcon architecture,” Musk said. It is set to fly at the end of this year.